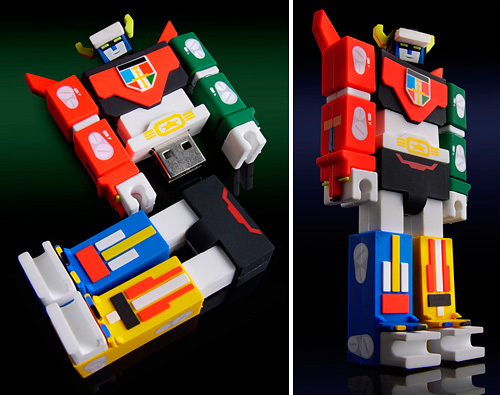 Voltron Nekobot Flash Drive Proves Capacity Isn't Everything | OhGizmo! What’s the first thing you do when someone gives you a promotional run-of-the-mill flash drive? You check the capacity to see if it’s big enough to be a keeper, or a future giveaway. But this Voltron Nekobot flash drive from INCUBOT Productions could be packing a measly 32MB and I’d still carry it everywhere. Thankfully it packs a usable, though not overly impressive, 2GB of storage which is accessible once Voltron’s been split apart at the waist. Pricing and availability haven’t been announced yet, but a limited edition ThinkGeek-only Nekobot flash drive currently sells there for $39.99. ..and Voltron predates power rangers by nearly a decade, it’s the Power Rangers’ Megazord that is based on Voltron, if anything.